Airport Eagles is equipped with an online booking system that's user-friendly, convenient and efficient. We offer speedy quotes. We offer simple and dependable online payment for extra ease as well. We even provide our customers with online invoices. We provide all of our clients' with their chauffeurs' telephone numbers. That makes reaching them simple and fast. We provide chauffeurs with client numbers as well. That enables them to notify you in the event of road traffic accidents, delays and beyond. Are you searching for airport taxi service Brighton that's the cream of the crop? Airport Eagles offers Brighton airport taxis that can seat upward of eight passengers at a time. Our fleet consists of licensed vehicles that are newly valeted. They're impeccably clean and safe, too. Our business is headquartered in Brighton and accommodates customers in nearby locales. We regularly accommodate customers in West Sussex and East Sussex. We can help you travel to business trips all throughout the United Kingdom via our dependable Brighton taxi. We offer wedding cars. 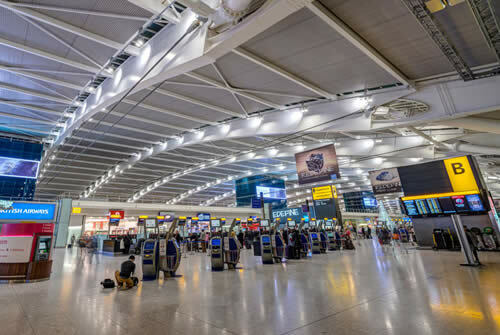 We offer reliable airport transfers Brighton services to help customers who wish to travel to airports in all parts of the United Kingdom without exception. If you want economy cars that are pleasant, modern and safe, you can turn to us. We have a reputation for rates that are economical and consistent. Our prestige cars offer amazing value. Our company makes promptness a top priority day in and day out. Our company has a reputation for providing customers with the greatest and most dependable airport transfer service around. Airport transfer assistance is one of our most prominent services. We go above and beyond to offer our customers professional chauffeur service that's budget-friendly, dependable and as speedy as can be. Convenience is always “the name of the game”. Explore them all right now. Are you interested in affordable deals that can get you from Brighton all the way to Gatwick Airport? We have them right here for you. Our hard-working transportation company specialises in the best chauffeur service in all of East Sussex. We offer airport transfer service that’s economical and reasonably priced as well. Call for information. Our executive booking come with complimentary newspapers. Let us know your favourite newspaper during the reservation and we will bring it along for you. The chauffeurs who are on our staff are all seasoned, knowledgeable and dependable. Our clients can count on them to provide chauffeur service that’s consistently strong in quality as well. If you request our convenient airport pickup service, we’ll wow you with flight monitoring assistance that’s meticulous, thorough and detailed. We specialise in airport pickup service that’s always on time. We work hard to listen to all of our customers’ needs and requests. If you want to work with a transportation firm that genuinely cares and understands, you are looking in the right place. "I love this transportation company to bits. The chauffeurs are some of the most professional people you could hope to meet. They're kind, attentive and thoughtful as well. I really recommend this firm." "It's hard to find a company that offers high-quality airport transfer service. It's safe to say, however, that this is a rare one that does. This firm is the best!" "If you're interested in airport taxis that define excellence and convenience, then this is the company for you. I'll never look anywhere else for airport transfer service again." Our hard-working director takes a hands-on approach to everything. He is particularly attentive all of the time and because of that promises all of our clients interactions that are personalised, customised and friendly. 2019 Airport Eagles. Airport Eagles Hove. Airport Eagles Peacehaven. All rights reserved.